In 1988, less than a month after graduating from college, I moved to New York to seek my fame and fortune. I worked for a large magazine publisher as an editorial assistant, which translates loosely as "slave." Remember the movie The Devil Wears Prada? All my friends thought it was funny. I cried through the whole thing. To be fair, the editors and writers I supported were nice to me, all things considered. But I definitely paid my dues. I worked at a travel magazine, and well-known freelance writers would routinely dump on my desk shopping bags full of crumpled receipts in multiple languages and currencies. It was my job to decipher them, fill out expense reports, and make sure they were paid as soon as possible. Note that this was before the Internet was available to help with things like historical exchange rates and translations to and from obscure languages. To this day I get hives every time I look at a receipt, and my own expense reports pile up for months. I lived by myself in Manhattan, but Ellen, one of my college roommates, lived in then-barely-gentrified Park Slope with two other friends from school. I often had to stay late at work and eat takeout, but they took turns cooking dinner for each other, a routine I envied. One of the recipes Ellen made for her roommates was Yucatecan chicken, marinated in a mixture of citrus juices, cumin and chiles. The recipe card I pulled out of my box this morning says to grill the chicken, but she must have broiled it, because I don't remember anyone having any outside space to grill. Ellen, if you're reading this, please correct me if I'm wrong. I thought of Ellen's Yucatecan chicken this morning as I looked at the hunk of frozen pork shoulder I wanted to make for dinner. I put it in the slow cooker, frozen solid, with all the flavors I remembered from my youth: lime and orange juice, garlic, chili powder, cumin, oregano. 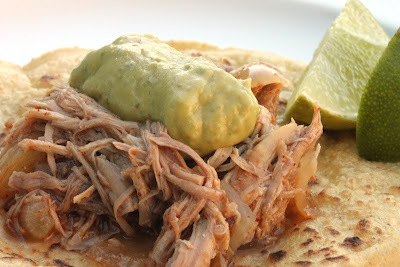 Eight hours on low while I was at work, and I came home to fork-tender pork, which I shredded, mixed with the juice in the cooker, and served with fresh corn tortillas and a creamy avocado dressing. Not quite the same as Ellen's chicken, but it hit all the right notes. If you can find Tortillaland's fresh uncooked corn tortillas, do give them a try. We live on the flour version - it's my kids' favorite for quesadillas - but I think the corn tortillas are even better. Thirty seconds on each side in a hot, dry nonstick skillet and you'd swear you had your own mamacita in the kitchen. They're available in many Costco stores, although not my local one, so thanks to Tortillaland for the free samples they sent me to make this dish. You can search for local Tortillaland retailers here. 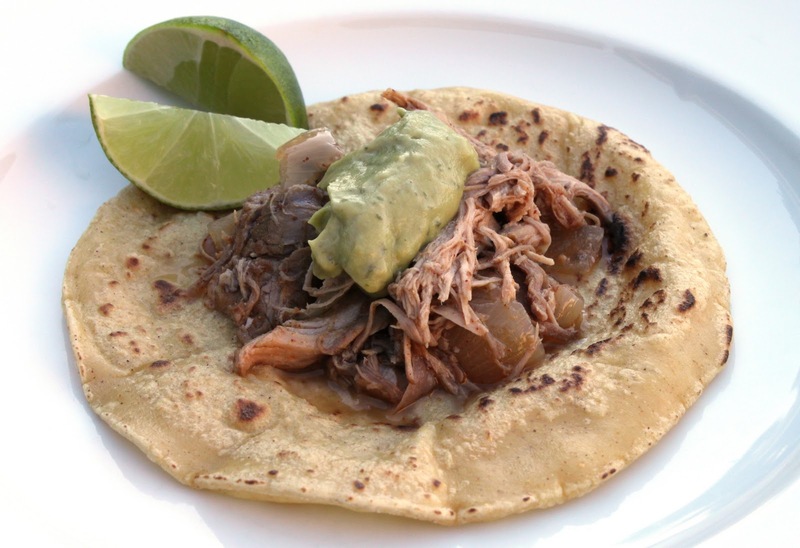 In a large slow cooker, put the pork, onions, lime and orange juice, chili powder, cumin, garlic salt and oregano. Cook on low for eight hours. Shred the meat with a fork, discarding any large pieces of fat. Keep the pork warm in the slow cooker until you're ready to serve. Put the avocado flesh, lemon juice, cilantro (the whole bunch, including most of the stems), and 1/2 tsp salt in a blender or food processor. Process until creamy and smooth, about 1 minute. Taste and add more salt if necessary. To serve, use a slotted spoon to put about 1/4 cup of shredded pork on each tortilla. Drizzle with the avocado dressing. The pork juices will run down your arm no matter what you do, so protect your clothing. This looks SO GOOD. I just got a slow cooker and I think this will be my first thing to cook in it! wow i love to cook so this blog is friggin' awesome. so glad blogspot recommended it as a "blog of note." I bet your house smelled wonderful as this pork was cooking!! A great weeknight meal and very versatile!! I love corn tortillas - don't make them that often anymore but fresh ones are the best! Great post. Your food always look so good. My compliments to you. Love this- anything good in the slow cooker is a keeper recipe (I hardly find any good ones!) Love these tortillas, too! I've got to make lunch for a group of men from our subdivision who have volunteered to work on our roads this weekend. Guess what I'm going to make? Perfect hearty food for these weekend warriors who will be working outside all day.. This looks amazing. I'd prefer pulled pork over chicken even if you didn't suggest it. I don't doubt that your version blew your friends out of the water! I read your recipe delicious and I liked your article .. I thank you for your excellent recipes in the preparation of delicious and distinctive. The cumin is what sends the flavor to the extreme. A wonderful recipe. Thank you!